Xiaomi smartphones are very much popular amongst all types of generations who are cost-efficient and quality-conscious. So if you're one of those Android device users who want to get high-end flagship phone experience in low-cost, then Xiaomi Mi5 Smartphone is probably the best choice for you. 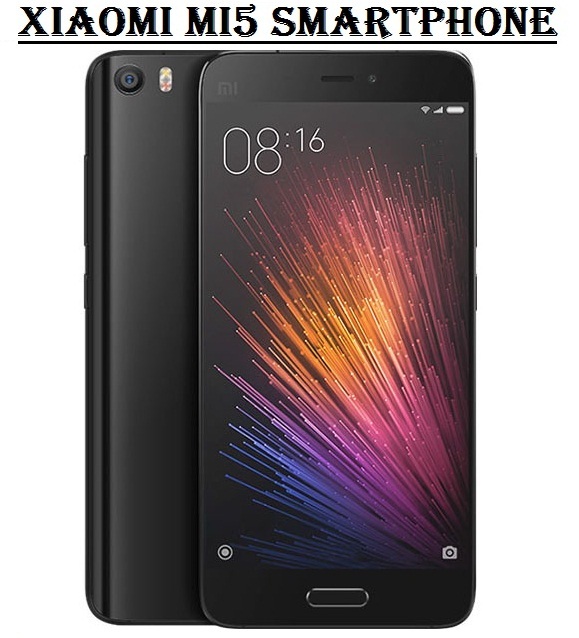 So let's find out all the official Xiaomi Mi5 Specs, Features, Price, Release Date, and Availability details with a detailed software and hardware review. The specifications and features of Xiaomi Mi5 Smartphone is quite attractive as compare to its price range. We are going to start the official Mi5 Specs Review with its network technologies i.e. 4G (LTE with speed LTE-A (3CA) Cat12 600/150 Mbps) / 3G (HSPA with speed 42.2/5.76 Mbps) / 2G (GSM), and it does have GPRS and Edge support too for lower internet connectivity regions. The body dimension of Xiaomi Mi5 is 144.6 x 69.2 x 7.3 mm having approx. weight 139 g / 129 g, and its front and back panel body build does have a protection of Corning Gorilla Glass 4. This phone do offers Dual Nano-SIM support with dual stand-by capability. The display screen is capacitive touchscreen with IPS LCD offering 16 million colors for sharp visibility. The display screen size of Xiaomi Mi5 is approx. 5.15 inches with 73.1% screen-to-body ratio, and the display screen resolution is approx. 1080 x 1920 pixels with 428 ppi pixel density, and it also has multitouch support function. If we talk about Xiaomi Mi5 software, so it's powered by all new Android Marshmallow v6.0 mobile operating system with MIUI 7.0 firmware. The hardware side is also impressive, as it offers Qualcomm MSM8996 Snapdragon 820 chipset, Adreno 530 GPU, and CPU processor powered by Quad-core (2x1.8 GHz Kryo & 2x1.36 GHz Kryo) for Mi5 Standard Edition and Quad-core (2x2.15 GHz Kryo & 2x1.6 GHz Kryo) for Mi5 Prime edition and Mi5 Pro edition respectively. The storage memory capacity of Xiaomi Mi5 is 32GB with 3GB RAM for Mi5 Standard, 64GB with 3GB RAM for Mi5 Prime, and 128GB with 4GB RAM for Mi5 Pro edition. There is no micro SD card slot available on this phone. The primary or back camera of Mi5 is 16 mega-pixel f/2.0 with dual-LED and dual tone flash, phase detection autofocus, OIS (4-axis), HDR, panorama, face/smile detection, geo-tagging, touch focus, 1.12 µm pixel size, and 1/2.8" sensor size features and functions. The primary camera video recorder can record videos in 720p@120fps, 1080p@30fps, and 2160p@30fps. The secondary or front camera is 4 mega-pixel f/2.0, 2µm pixel size, 1/3" sensor size with 1080p@30fps for video recording. For communication purpose, the all new Xiaomi Mi5 has WLAN support of WiFi 802.11 a/b/g/n/ac, dual-band, DLNA, Wi-Fi Direct, hotspot, Bluetooth v4.2, LE, A2DP, GPS with A-GPS, BDS, GLONASS, Infrared Port, NFC, and a USB Type-C 1.0 reversible connector for data transfer and phone charging. The Xiaomi Mi5 Specs also includes some useful sensors i.e. barometer, proximity, compass, accelerometer, gyro, and Fingerprint. The battery capacity of phone is 3000 mAh, and yes! It’s non-removable too. You can fast battery charge Mi5 battery upto 83% within 30 minutes with its Quick Charge 3.0 feature. Xiaomi Mi5 is officially available in four colors i.e. Ceramic, White, Black, and Gold. Xiaomi users can buy this smartphone from any Xiaomi Store worldwide. 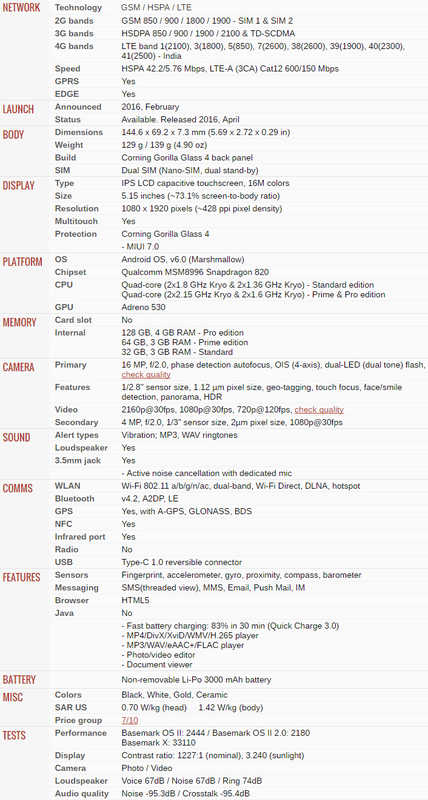 The official Xiaomi Mi5 price is approx. 380 EUR in euros for European Union, $403 USD in dollars for USA, and 23,000 INR in Rupee for India. We think this price range is quite reasonable for all the features, functions and specifications we have discussed above.